It’s early October 2016. Bit by bit the space of Oriel Sycharth is shifting: first an empty white cuboid, now a heap of boxes and packages, then as if by artistic alchemy, a fully formed exhibition. Barbara was there throughout, piecing together her works, which dealt so deftly with ideas of landscape, the politics of space, history, and feminism, in what I learned were ‘shallow space’ installations. 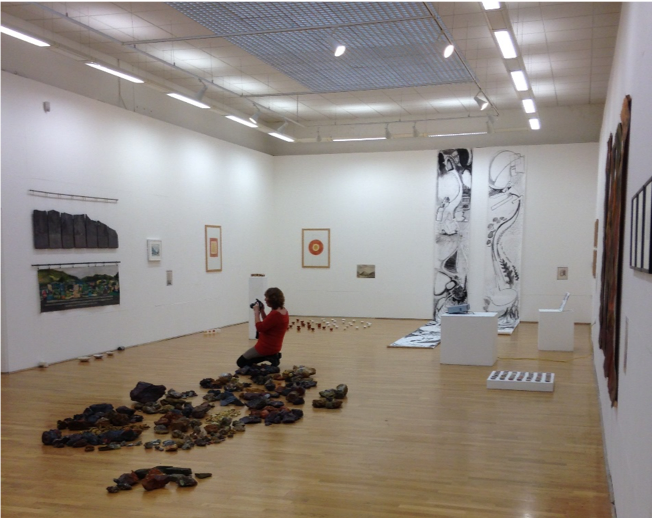 Starting with a scythe, she looped photographs, drawings, and small paintings downwards, in a method inspired by the landmarks featured in early strip maps. In these works, Barbara was illustrating a walk around Mallwyd and Dinas Mawddwy, its beautiful landscapes, ancient associations with banditti, and ‘private’/’keep out’ warnings, all which she explained best in her own words in a blog post for our project about historical travel writing, and on her own website. The works she made for the exhibition were colourful, provocative, and, in the hanging slates on which she’d engraved the outline of a mountain range, mesmerisingly (and deceptively) simple and pretty. She was the last to leave the gallery that day, quietly and methodically photographing all the assembled works long after everyone else had gone. This exhibition, and exhibitions of the same works in two other galleries, changed forever how I think about academic research; more than that they were enormous fun – events that celebrated women’s art and collectivity with so much wit and generosity because of the artists involved in them. Driving up the last narrow lanes to Brondanw – it’s summer now, 2017, and the exhibition has moved west and north into the mountains; the mountains have become part of the exhibition, framed in the windows of the Plas. Here we fill not a shining white space but rooms of all sizes on many levels, and we are running up and downstairs looking for clips and ladders and lights. And laughing. Dylan is printing off labels as fast as he can. Marged’s practised eye judges heights and levels, light and shade. She has decided who goes where. More laughing. We lug Ali’s rocks in boxes out of the van, down the path, past the wisteria and up the curve of the stairs to be spread out on the dark wooden floor. Barbara is already there with her astonishing scythe – she hangs it, in perfect equilibrium, against a white wall. Her delicate printed-paper bowls each find their own space in the cabinet. The house fills up with stories. In Aberystwyth’s Old College we have less room to play with but this time the sea joins us, framed in a big bay window. One evening some of the artists give talks about their work. Barbara tells us about the copper ladies, mentioned by early travellers, picking over the lumps of ore up at Mynydd Parys. 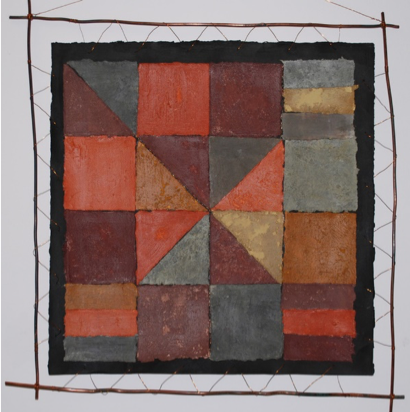 She uses the pigments in her beautiful piece, ‘Quilt for a Copper Lady’, where the intensive, repeated gestures of different types of women’s work collide and surprise. Those bright colours. That bright laugh. A legacy. This entry was posted in Walkers' Blog on 23rd November 2018 by Luca Guariento.